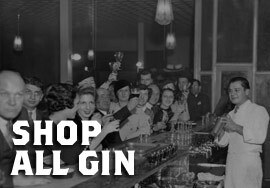 Gin is a pretty varied category offering everything from the sublime Hendricks Gin to the piney Beefeater Gin and everything in between. If you're looking to make a gin and tonic, you'll definitely need to pick one of these bottles up. Elephant Strength is based on the award-winning Elephant London Dry Gin and with its 57% ABV, it is stronger and richer than the original. The Strength encompasses twice the quantity of botanicals and a focus on the extraordinary African buchu, sweet orange peel and herbaceous mountain pine. It is a gentle giant! The gin is powerful (think elephant-powerful), intense and full-bodied, with a fresh aroma and a higher viscosity than the original; superb in cocktails, it�s equally perfect for recreating the African bush Sundowner experience and for bold adventures across urban plains. The Elephant Strength bottle takes inspiration from its naval origins with navy blue accents and an inviting map of the ocean, conjuring far-flung exploration and the spirit of adventure at the heart of the brand. Instead of the hemp string that ties around the London Dry bottles, the Strength Gin features a rope-like string with a charming miniature anchor hanging from it. A bold, juniper backbone is balanced by bright citrus, clean herbal and vegetal notes, with a lingering, peppery expression of earth and sea. This premium, artisanal spirit is born of AC Hazlet Winter Rye (non-GMO) planted and harvested by the distiller on the family farm. Every step of production - milling, mashing, fermenting, distilling and bottling - is done by hand at Far North Spirits. Gustaf's 11 botanicals are individually distilled to capture each one's best attributes. Botanicals include juniper, Meyer lemon, grains of paradise, fennel, coriander, meadowsweet and others. Individual distillations are blended together to create the final spirit. Although most gin is produced by distilling all botanicals at once in a single run, Far North is committed to this more labor intensive process as it results in a truly superior gin with greater depth and character. the botanicals are distilled separately according to each feature of botanicals to extract the best flavour and maintain their individual characteristics. whereas the deep flavour of yuzu is achieved by distillation in copper pot stills.